Journey into Aurangabad and visit the caves and temples carved into the rocky sides of this massive gorge on a private tour of Aurangabad. See the famous cave temples of Ellora and travel back in time to the 5th and 8th centuries A.D. as your guide shares insights, information and history about the Hindu, Buddhist and Jain faiths represented here. 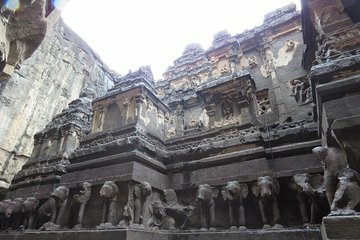 Tour the Kailasa Temple revel in its incredible beauty as part of this full-day private tour. We did not have time to cover 2 sites on separate days so opted for 1 trip. It was a long day due to distance between sites but our guide made the journey interesting and although we were caved out by the end we did see what we wanted and guide was very informed about the story in the paintings. It's a long day to visit both Ellora and Ajanta sites, but the selection of caves on this tour hit the high notes. I was well-pleased with my visit. We wanted to do both caves in one day because we were on a tight schedule. The guide was excellent and we did not feel like we missed out on anything. Wonderful places. Knowledgeable guide. The driver didn't give us filling of save drive. We weren't sure we could get adequate time at both Ajanta and Ellora caves on just a day tour, but we are now. The driver and guide were excellent, and the tour started at 7am -- unlike the 8am noted in our confirmation and a follow-up email. The guide was excellent, an archaeologist who had worked at both sites. He not only knew which caves to spend the most time in, he gave us a tremendous amount of information and provided enough time for us to thoroughly enjoy each site. Bathroom stops were arranged very well -- believe me, this is important as there are very few good places to stop along the way. Also, lunch at a hotel was far better than what we could have gotten at Ajanta. All in all, a terrific day tour.